The pumpkin sits… and the pumpkin watches. Well folks – Trader Joe’s annual corn madness is upon us once again. The pumpkin hoppers have been serviced, the pumpkin chutes re-greased, and the pumpkin crazed madmen in the R&D department are off to a flying start with Trader Joe’s Pumpkin Cornbread. 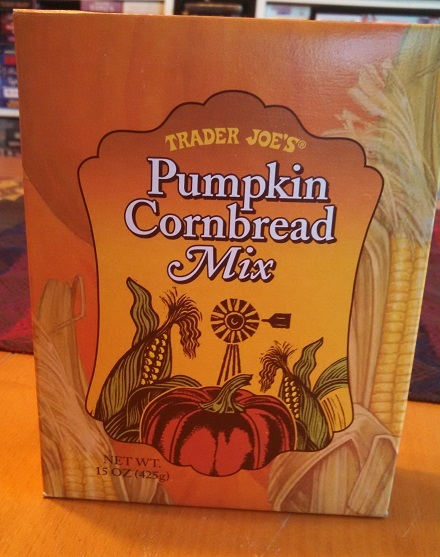 What possessed Trader Joe’s to add dehydrated, powdered pumpkin to cornbread I can’t say, whatever it was, it’s the same mechanism that drove TJ to put pumpkin in waffles and croissants. In all these products the addition of pumpkin seems completely superfluous – an unnecessary ingredient shoehorned into an food that was already perfectly fine. The pumpkin will not be denied. It’s almost sinister, in an Invasion of the Body Snatchers kind of way. You turn around and what you thought was cornbread is now pumpkin cornbread. You go to the fridge only to find your cream cheese is now pumpkin cream cheese and your yogurt has been replaced with pumpkin yogurt. You go to the Trader Joe’s to complain, but everywhere you look there’s more pumpkin products, insinuated into every aspect of your daily life, each box being dutifully stocked on the shelves by smiling Trader Joe’s employees. At any rate, they did go and put pumpkin in cornbread, so I went ahead and ate it. I wasn’t exactly sure what to expect, even on a basic level. Notions as to what “cornbread” means varies wildly from state to state. In the South, where cornbread got its start, it’s made with practically no sugar and little or no flour. Up North, in Yankee lands, it’s a much sweeter dish, made with plenty of sugar and wheat flour besides making it more airy and cake-like. Meanwhile, out in the great Southwest it’s commonly made with creamed corn, jalapenos, and even topped with melted cheese. Trader Joe’s Pumpkin Cornbread uses a Northern cornbread recipe, going heavy on the wheat and sugar, and fairly light on the corn meal and pumpkin. In fact, flour and sugar are the first two ingredients on the box, only then followed by corn meal and finally pumpkin. The result is a light, cakey cornbread, that cooks up in 30 minutes or so. Fresh out of the bag, the cornbread mix smells delightfully redolent, as a heady mixture of spices wafts up to the nose. Pumpkin can be detected in here, sure, but cinnamon, nutmeg and cloves even more so – all the classic spices you find in pumpkin pie filling. The finished cornbread cooks up to a rich, golden brown – darker than ordinary cornbread. Following the directions exactly results in a dry, crumbly cornbread that’s ready and willing to soak up some butter. If you like a moister cornbread, you’ll want to consider adding a touch more oil and milk. Shockingly, despite the pumpkin pie smell that comes off the cornbread, there’s almost no taste of pumpkin in the bread at all. In fact, it almost tastes exactly like regular cornbread, except spiced with a gentle amount of the above mentioned pumpkin pie spices. 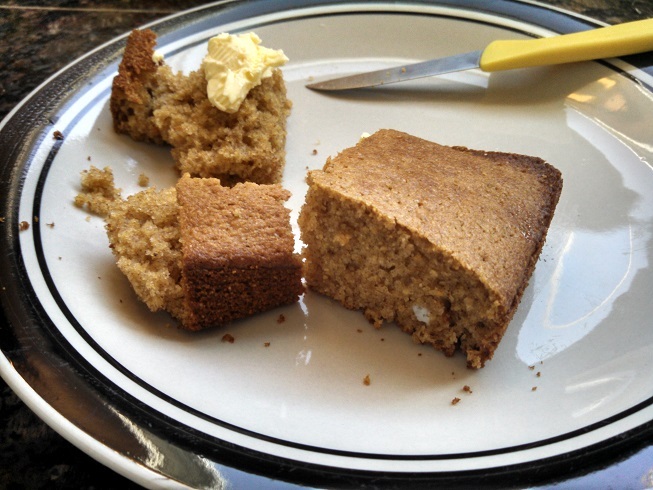 This isn’t a heavy spice cake, but a light touch that imbues an otherwise traditional cornbread recipe with an intriguing taste of autumn flavor. Personally, I was disappointed that there wasn’t more of a pumpkin presence in the bread – why bother calling it pumpkin cornbread if you’re not really putting any pumpkin in it? That said, even without a strong pumpkin taste, the cornbread is quite tasty. The touch of spice adds an extra dimension to the bread, and really comes to the fore when loaded up with a good pat of butter. Would I Recommend It: Yes, this is a good fit for autumn dinners. Would I Buy It Again: I’d probably buy this before I bought regular cornbread, to be honest. Final Synopsis: More pumpkin pie spice cornbread than pumpkin cornbread. I really wouldn’t consider it a dessert – it’s more savory than sweet. My guess is that it’d go fine with chili, but I’m sure it would work with ribs, or just a chicken dinner as well. Basically, the spices are light enough that you can use it in place of regular cornbread without trouble. Im considering adding corn and ortega chills to give a cornbread taste rather than a dessert cake. since TJ no longer carries this product, any idea where this same product CAN be bought? ?